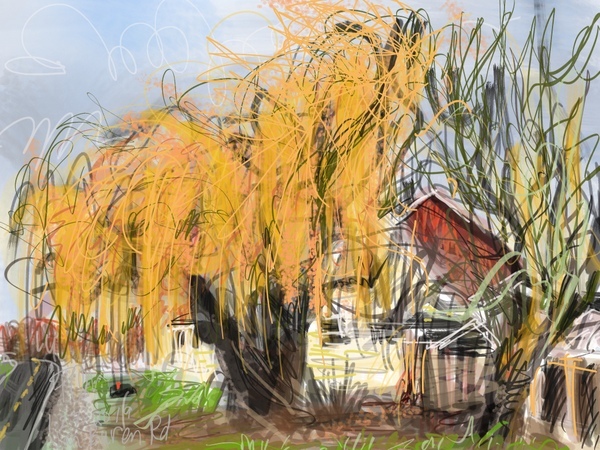 This glorious golden willow tree in beautiful Fall colors grabbed my attention so I pulled off to the side of the road. I sat inside my car and sketched 4 beautiful farmhouses on a nice slow drive to Lynden, WA. Google Maps said it was a 20 minute drive but my sketching drive took about 4 hours instead! FABULOUS!! Digital plein air painting, Procreate App on iPad with apple pencil. Lots of layers with watercolor and marker effects.